If there were such a thing as the Binge Eating Olympics, I’d be drowning in a sea of gold medals. At first I wasn’t sure why? But eventually (uh, 30 years of eventually), I figured out there were 3 Reasons You’re STILL Bingeing and now I can tell you how to STOP doing it and START getting your sanity back. When I was stuck in the battle with my body and food, I would eat when I was happy, sad, mad or glad. I was what you might call a non-biased eater. No special occasion required. Just as long as I didn’t have to feel or deal with anything apart from the taste of chocolate cookies in my mouth. How to STOP it now, if not sooner. But first… Did you miss the memo? 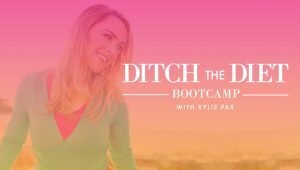 Ditch the Diet Bootcamp is running live for the FINAL TIME! There’s a whole bunch of pretty awesome VIP Early Bird savings PLUS a tonne of BONUSES that I have NEVER released before over on the sign-up page (which is really a magical portal to everything you’ve ever wanted in your whole life) so swing your booty over there, gurl! Of course, the best part is the full TWO WEEK LOVE IT OR LEAVE IT PROMISE. You literally have nothing to lose here! If you still can’t stand next to chocolate cake without wishing you could roll around in it, naked… Then click the link. 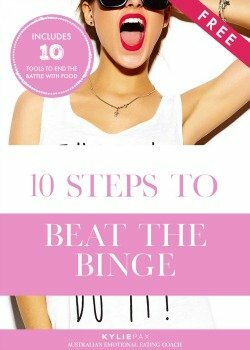 Are you ready to beat the binge in 2018? I’m offering a full TWO WEEK LOVE IT OR LEAVE IT PROMISE!